LZR2 implements the lossless compression /decompression algorithm. Typical applications include enterprise data storage. 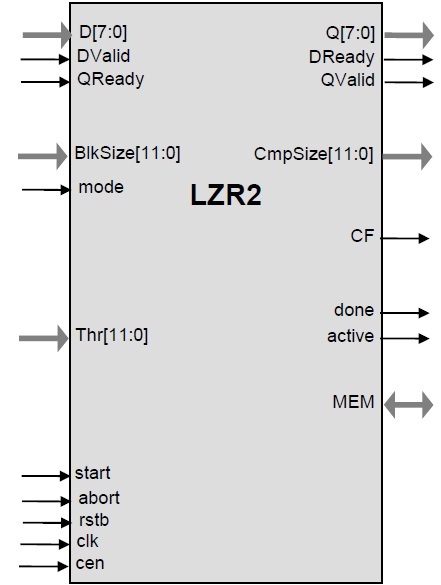 LZR2 delivers sustained (gapless) throughput of 8 bits per clock on the decompressed side or about 1-2.5 Gbps of throughput in FPGA and 4-6 Gbps in ASIC implementations. The compression ratio greatly depends on the data and somewhat depends on the frames size; on typical file corpuses varies between 1.5 and 2..
estimate Input HIGH level indicates suppression of the compressed data (Cout). The core implements lossless compression / decompression and encryption / decryption of data blocks from 512 bytes up to 4096 bytes (longer lengths can be configured).